S.A.F.E.R. Numerical Simulation for Structural Analysis in the Aerospace Industry Part 5: An Introduction to StressCheck for High-Fidelity Aero-structure Analysis | ESRD | Engineering Software Research and Development, Inc. In our last S.A.F.E.R. 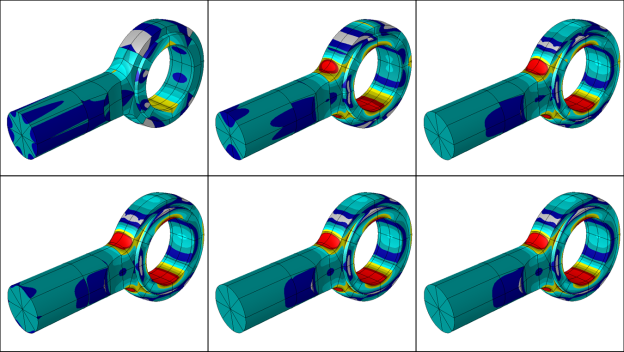 Simulation post, we explored the growing importance of Verification and Validation (V&V) as the use of simulation software becomes more wide spread among not just FEA specialists but also the non-FEA expert design engineer. The emphasis on increased V&V has driven a need for improved Simulation Governance to provide managerial oversight of all the methods, standards, best practices, processes, and software to ensure the reliable use of simulation technologies by expert and novice alike. In this final post of our current series we will profile the stress analysis software product StressCheck® and the applications for which it is used in A&D engineering. StressCheck® incorporates the latest advances in numerical simulation technologies that provide intrinsic, automatic capabilities for solution verification through the use of hierarchic finite element spaces, and a hierarchic modeling framework to evaluate the effect of simplifying modeling assumptions in the predictions. We will detail what that actually means for engineering users and how StressCheck® enables the practice of Simulation Governance by engineering managers to make simulation Simple, Accurate, Fast, Efficient, and Reliable – S.A.F.E.R. – for experts and non-experts alike. StressCheck® live results extraction showing the convergence of maximum stress on a small blend in an imported legacy FEA bulkhead mesh. StressCheck® is an engineering structural analysis software tool developed from its inception by Engineering Software Research & Development (ESRD) to exploit the most recent advances in numerical simulation that support Verification and Validation procedures to enable the practice of Simulation Governance. While StressCheck® is based on the finite element method, StressCheck® implements a different mathematical foundation than legacy-generation FEA software. 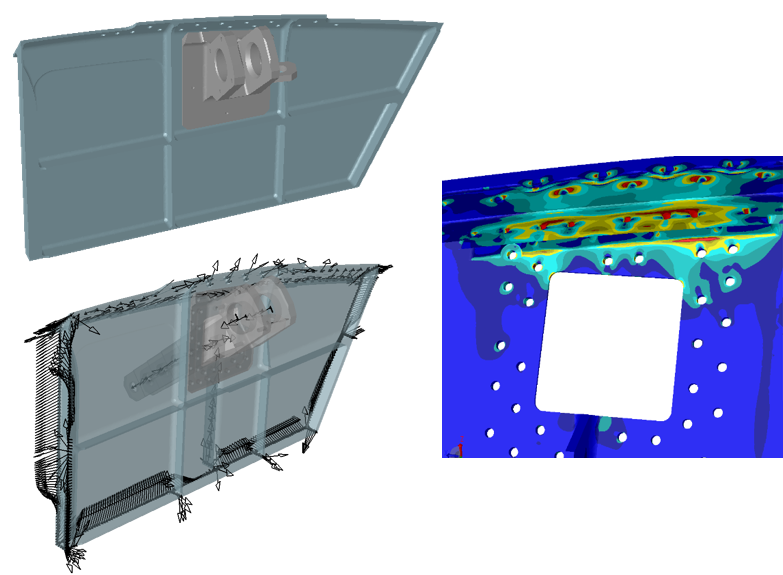 StressCheck® is based on hierarchic finite element spaces capable of producing a sequence of converging solutions of verifiable computational accuracy. This approach not only has a great effect on improving the quality of analysis results but also in reforming the time-consuming and error-prone steps of FEA pre-processing, solving, and post-processing as they have been performed for decades. The origins of StressCheck® extend from R&D work performed by ESRD in support of military aircraft programs of the U.S, Department of Defense. The motivation behind the development of StressCheck® was to help structural engineers tackle some of the most elusive analysis problems encountered by A&D OEM suppliers and their contracting agencies in the design, manufacture, test, and sustainment of both new and aging aircraft. Historically, many of these problem types required highly experienced analysts using expert-only software tools. Yet even then, the results produced were dependent on the same expert to assess their own validity of output. During the development of StressCheck®, ESRD realized that many aerospace contractors were frustrated with the complexity, time, and uncertainty of stress analysis performed using the results of legacy finite element modeling software. As a consequence, it was not uncommon that engineering groups relied upon or even preferred to use design curves, handbooks, empirical methods, look-up tables, previous design calculations, and closed-form solutions. The time to create, debug, and then tune elaborately constructed and intricately meshed finite element models was just too exorbitant, especially early in the design cycle where changes to geometry and loads were frequent. StressCheck® was developed to address these deficiencies. Since its introduction it has now been used by every leading U.S. aircraft contractor along with many of their supply chain and sustainment partners. What are the applications for StressCheck® in the A&D industry? StressCheck® is ideally suited for engineering analysis problems in solid mechanics which require a high-fidelity solution of a known computational accuracy that is independent of the user’s expertise or the model’s mesh. In the aviation, aerospace, and defense industries these application problem classes include: structural strength analysis, detail stress analysis, buckling analysis, global/local workflows, fastened and bonded joint analysis, composite laminates, multi-body contact, engineered residual stresses, structural repairs, and fatigue and fracture mechanics in support of durability and damage tolerance (DaDT). To explore examples of these applications visit our Applications showcase area and click on any of the featured tiles. StressCheck® is not intended to be a replacement for general purpose finite element codes used for internal loads modeling of large aero-structures or complete aircraft. In these global loads models an artisan-like approach of building up a digital structure using an assortment of 2D frame and shell element types, typically of mixed element formulations with incompatible theories, may be sufficient when accuracy beyond that of approximate relative load distributions is unimportant. Most of the strength, stress, and fatigue analyses performed by aerospace structures groups occurs downstream of the global loads modeling. Historically, these analyses workflows required a series of models, each progressively adding in more structural details that had previously been approximated in often crude fashion or ignored all together. Multi-scale, global-local including multi-body contact analysis of wing rib structure in StressCheck®. Using StressCheck® it is now feasible to employ FEA with analysis problems which require modeling large spans of an aero-structure that has widely varying geometric dimensions with numerous joints, fasteners, cutouts, material types and stress concentrations. Before with traditional FEA methods it was often impossible to use solid elements throughout a multi-scale model using geometry directly from CAD data. So much time and often tricks were required to simplify, defeature, approximate, and repair the design topology that engineering managers were reluctant to approve the use of FEA for some analysis types. Because of its inherent robustness and reliability, StressCheck® is also ideal as the solver engine powering a new generation of Simulation Apps which help to democratize the power of simulation. Smart Sim Apps based on StressCheck® can help to simplify, standardize, automate, and optimize recurring analysis workflows such that non-expert engineers may employ FEA-based analysis tools with even greater confidence than expert analysts can using legacy software tools. 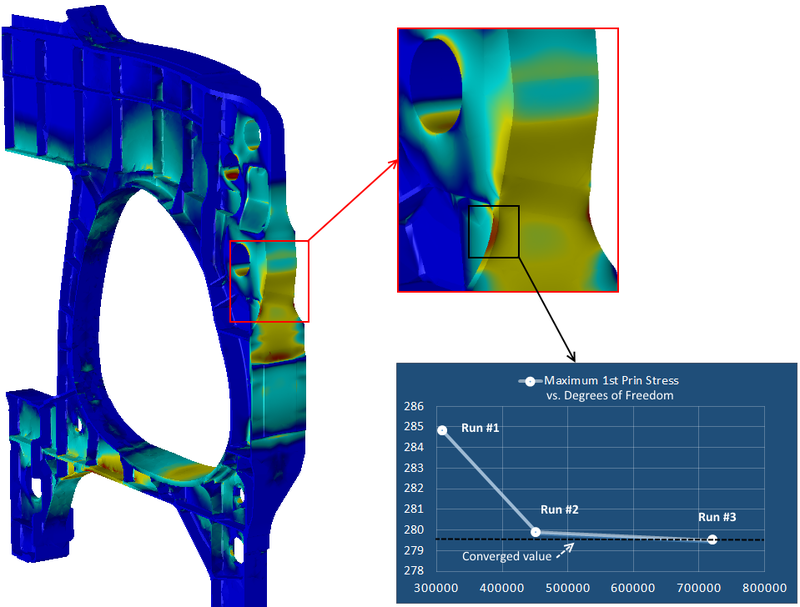 How is StressCheck®‘s numerical simulation technology different from that used by legacy or traditional FEA softwares? What are the key differences and advantages of StressCheck® for users? StressCheck® has numerous intrinsic features that support hierarchic modeling, live dynamic results processing, automatic reporting of approximation errors & more. The most visible difference to the new user is that StressCheck® employs a much smaller, simpler, and smarter library of elements. There are only five element types to approximate the solution of a problem of elasticity, whether it is planar, axi-symmetric, or three-dimensional. This compares to the many dozens of element types of legacy FEA software which often require a wizard to know which one to select, where to use or not to use them and more importantly, how to understand their idiosyncrasies and interpret their often erratic behavior. The second big difference for users is that StressCheck® elements map to geometry without the need for simplification or defeaturing. The available higher-order mapping means that the elements are far more robust with respect to size, aspect ratio, and distortion. As such, a relatively coarse mesh created just to follow geometry may be used across variant-scale topologies. There is no loss of resolution or a need for intermediate highly simplified “stick & frame” or “plate & beam” models. StressCheck® meshes are much easier to create, check, and change as the elements and their mesh no longer have to be the principal focus and concern of the analyst’s attention. StressCheck® models aren’t fragile nor do they break as easily, and thus have to be recreated, with changes to design geometry, boundary conditions, or analysis types (e.g., linear, nonlinear, buckling). For example, a linear analysis result is the starting point for a subsequent nonlinear analysis, so the analyst simply switches solver tabs to obtain a nonlinear solution. Because of the use of hierarchic spaces during the solution execution, each run is a subset of the previous run, making it possible to perform error estimation of any result of interest, anywhere in the model after a sequence of solutions is obtained. So, what’s the bottom line? 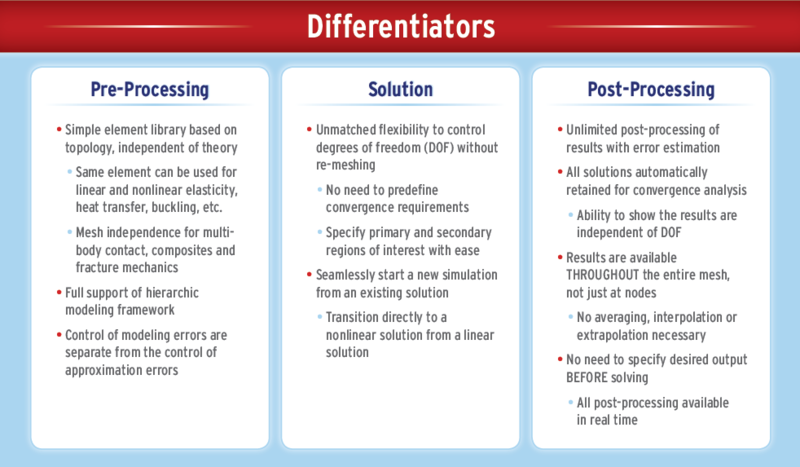 High-fidelity solutions can be obtained from low-density meshes while preserving an explicit automatic measurement of solution quality. No guesswork is required to determine if the FEA result can be trusted. Detailed stress concentrations represented on “low-density” StressCheck® meshes. The errors of idealization are separated from those due to discretization/approximation (e.g. do I have ‘enough’ mesh? DOF? Element curvature?). Sources of inaccuracies and errors are immediately identifiable not because an expert catches it, but because the software is intelligent enough to report them. For each analysis users are provided with a dashboard of convergence curves that show the error in any one of a number of engineering quantities such as stress, strain, and energy norm. What is the benefit to engineering groups and value to A&D programs from the use of StressCheck®? StressCheck® automatically increases the approximation of stresses on a fixed mesh, making solution verification simple, accurate, fast, efficient & reliable. With the use of StressCheck®, the results of FEA-based structural analysis are far less dependent on the user expertise, modeling approximations, or mesh details. High-fidelity stress analysis of complex 3D solid model geometries, with numerous joints and fastener connections typical of aero-structures may be obtained in less time, with reduced complexity and greater confidence. As a result, the stress analysis function becomes an inherently more reliable and repeatable competency for the engineering organization. FEA-based structural analysis performed with StressCheck® is not an error-prone process where every different combination of user, software, elements, and mesh risks generating different answers all to the dismay of engineering leads and program managers. By using industry application-focused, advanced numerical simulation software like StressCheck® it is now possible to simplify, standardize, and automate some recurring analysis tasks to become more robust for less experienced engineers to conduct. New engineers are productive sooner with access to safer analysis tools that are intelligent enough to capture institutional methods and incorporate best practices. 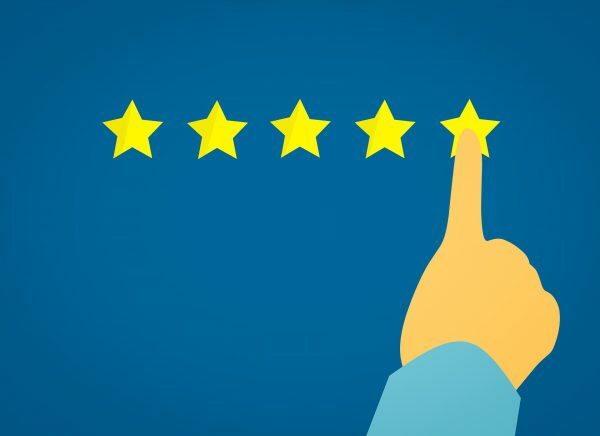 The role and value of the expert engineering analyst evolves to a higher level by creating improved methods and custom tools such as automated global local workflow templates and Sim Apps, respectively. As presented in the first post of this series, the business drivers to produce higher performing damage tolerant aero-structures are requiring a near hyper-level of engineering productivity, precision, and confidence from the use of simulation technologies earlier in the design cycle. This is also true in the later stages as digital simulation replaces more physical prototyping and flight testing to facilitate concurrency of engineering and build. Status-quo methodologies dependent on expert-only software that risk adding more time, risk, and uncertainty to the project plan is no longer satisfactory to meet these demands. Next generation simulation technologies implemented in software like StressCheck® can help to encapsulate complexity, contain cost, improve reliability, mitigate risk, accelerate maturity, and support better governance of the engineering simulation function. With StressCheck® engineering simulation is Simple, Accurate, Fast, Efficient, and Reliable. We will discuss why StressCheck® is an ideal numerical simulation tool for both benchmarking and digital engineering handbook development (i.e. StressCheck® CAE handbooks). In addition, we will provide examples of how StressCheck® CAE handbooks are a robust form of Smart Sim Apps that serve to encapsulate both tribal knowledge and state-of-the-art simulation best practices.